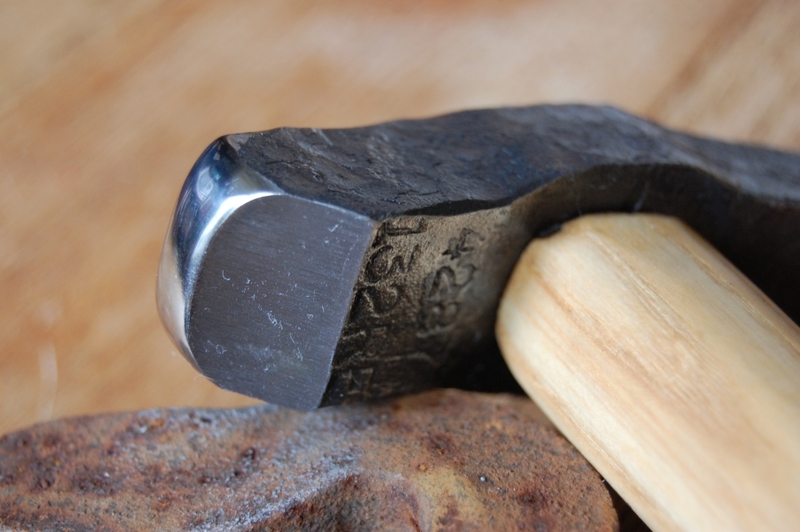 If you have not seen a Japanese hammer (genno or shinzan) made my a master blacksmith, then you are missing out on one of the most beautiful tools ever made. 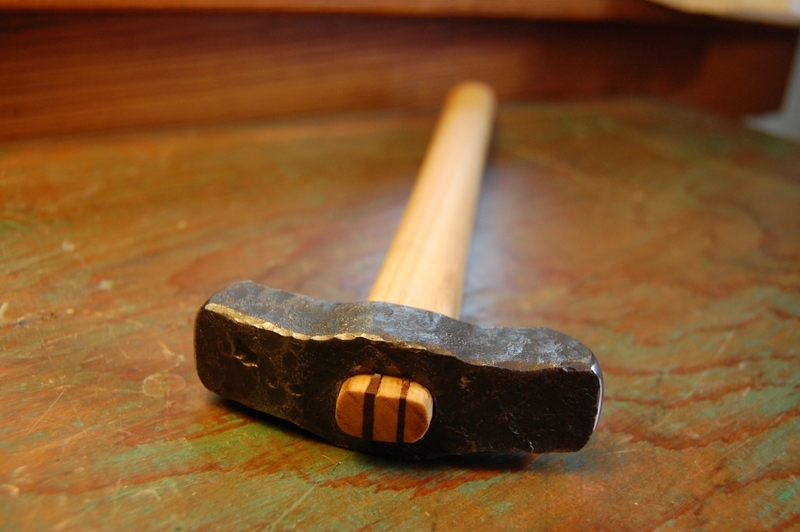 I am particularly taken with a style called a ‘Shinzan’ hammer. Take a look at one here. I have long wanted one but cannot afford a hundred dollar hammer, regardless of how beautiful they are. So it was off to the forge for me. I am obviously still on the hammer making kick and I was able to get two things I wanted at once. I needed a raising hammer for the copper work I am doing and I wanted a hammer head that looked like the Shinzan hammer I had seen. This picture has three interesting things in it. There is the piece of rusted metal exactly like the one I dug out of a scrap pile to make my head. There is the drift that I made to punch and shape the handle hole. And lastly, the head itself. I am really happy with how this all turned out. The silver look of the drift is due to the anti-seize compound I put on the drift before I drove it through. The grease burned off and it plated the drift with this silver metal. I learned this trick from a very kind local blacksmith. It kept the drift from sticking in the head when I drove it through. The stock that I started the head from had some numbers stamped into it and I thought they were pretty cool. I was able to save them on the bottom of the head. This is obviously not a Shinzan shaped hammer as it has an arching body, but I like how the one I had seen used hammer blows for a decorative effect. That was part of what I was going for. I used two different sized wedges to hold the head in. 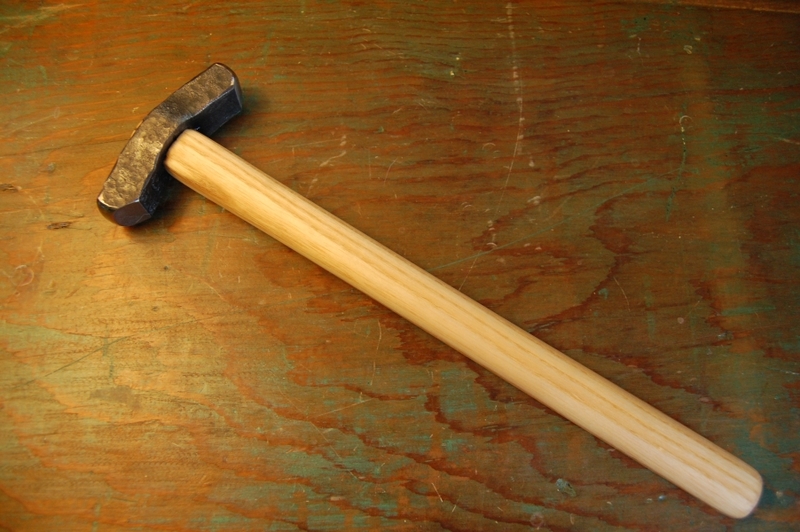 the hammer has a 1/4″ face and a 3/8″ face. I put the smaller wedge on the smaller face side so I could tell which way the hammer was turned while I was raising. I made the handle longish and straight to make it look even more like a Japanese style hammer. I was not sure at first if I would like a straight handle and I initially carved the handle in a western style. It just didn’t look right so I grabbed the spoke shave and ended with this. It feels great in my hand. I raised one course on a 6″ copper bowl tonight and this is a fantastic hammer. None of this would have been possible without the use of my friend Dave’s forge. Thanks Dave! 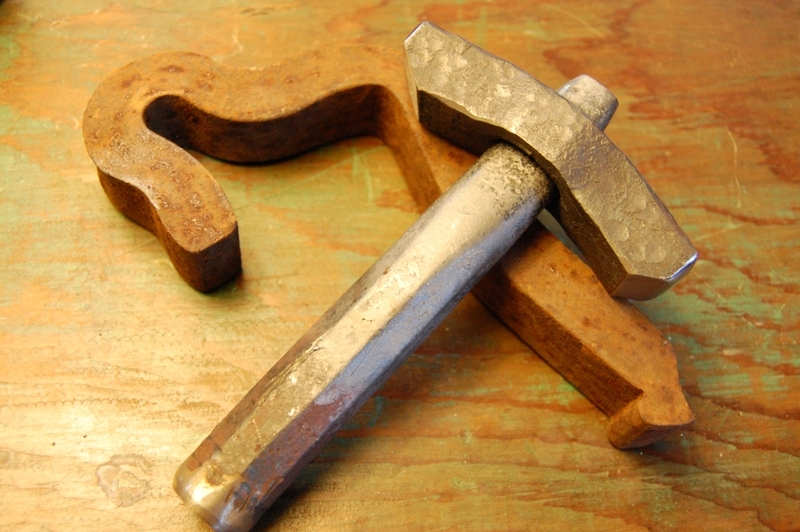 This entry was posted on July 19, 2010 at 2:25 am and is filed under Blacksmithing, Forging, Hammers, metalwork, Raising Copper, Tool Making. You can follow any responses to this entry through the RSS 2.0 feed. You can leave a response, or trackback from your own site. Wowzers! My brother, David, is so awesome. He has amazing talents…one of which is being the most loving and compassionate brother! I am proud to see how the two of you worked together with your hands and produced this hammer. You both…ROCK! Forge head!!! That piece of metal Dave, is a spring clip from a railroad track. Its 1070 steel and makes very nice knives. And obviously a nice hammer. Would you consider making this hammer for me? I don’t have time to do this right now, even though I would love to. If I free up, I will try and let you know.